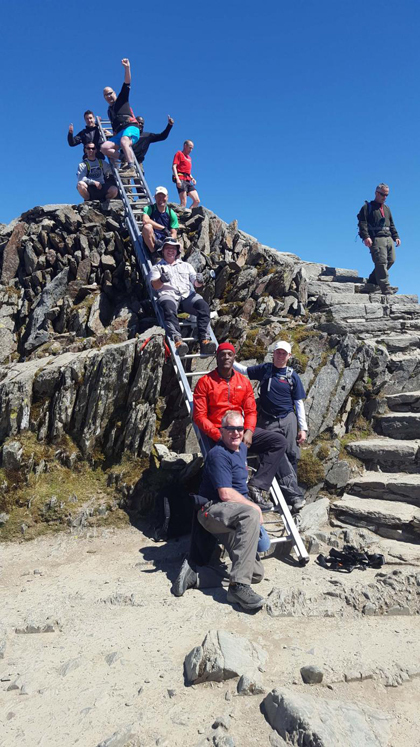 Shropshire firefighters put up a ladder at the peak of the highest mountain in Wales today as part of a marathon charity event. A nine strong crew from Shrewsbury Fire Station scaled the heights of Snowdon today(May 8th) setting off from the Llanberis Pass starting point at 9am. They carried the heavy and cumbersome 5.4m double extension ladder, which stretches to nine metres, a total of 1,085 metres (3,560ft) to the top for a photo opportunity with a difference before triumphantly lugging it all the way back down again. “It all went very well. Everyone worked hard and we got the job done. Four of us carried the ladder for ten minutes each and then we did a seamless swap until we got to the top,” said Watch Manager Graham Oliver. “A lot of people asked us why we were doing it and we got a lot of positive comments about the Mayor of Shrewsbury’s Charity for defibrillators for local schools and the Fire Fighters Charity.” To raise more money for the combined charities, Red Watch is asking for £1 for people to guess how long they took to complete the whole challenge. To raise more money for the combined charities, Red Watch is asking for £1 for people to guess how long they took to complete the whole challenge.